The transition from growth to development in Dictyostelium is initiated by amino acid starvation of growing amobae. In other eukaryotes, a key sensor of amino acid starvation and mediator of the resulting physiological responses is the GCN2 protein, an eIF2α kinase. GCN2 downregulates the initiation of translation of bulk mRNA and enhances translation of specific mRNAs by phosphorylating the translation initiation factor eIF2α. Two eIF2α kinases were identified in Dictyostelium and studied herein. Neither of the eIF2α kinases appeared to be involved in sensing amino acid starvation to initiate development. However, one of the kinases, IfkA, was shown to phosphorylate eIF2α from 1 to 7 hours after the onset of development, resulting in a shift from polysomes to free ribosomes for bulk mRNA. In the absence of the eIF2α phosphorylation, ifkA null cells aggregated earlier than normal and formed mounds and ultimately fruiting bodies that were larger than normal. The early aggregation phenotype in ifkA null cells reflected an apparent, earlier than normal establishment of the cAMP pulsing system. The large mound phenotype resulted from a reduced extracellular level of Countin, a component of the counting factor that regulates mound size. In wild type cells, phosphorylation of eIF2α by IfkA resulted in a specific stabilization and enhanced translational efficiency of countin mRNA even though reduced translation resulted for bulk mRNA. IfkA is an eIF2α kinase of Dictyostelium that normally phosphorylates eIF2α from 1 to 7 hours after the onset of development, or during the preaggregation phase. This results in an overall reduction in the initiation of protein synthesis during this time frame and a concomitant reduction in the number of ribosomes associated with most mRNAs. For some mRNAs, however, initiation of protein synthesis is enhanced or stabilized under the conditions of increased eIF2α phosphorylation. This includes countin mRNA. Dictyostelium is one of the simplest studied eukaryotes that possesses true multicellularity . Dictyostelium amoebae grow and divide asexually while feeding on bacteria or within an enriched broth. When the food supply is depleted, Dictyostelium cells shut down growth and cell division and enter a developmental program designed to produce and disperse spores. Mounds of about 105 cells form as cells stream together though chemotaxis in response to cAMP pulses. During late aggregation, the initially identical cells differentiate into several prestalk and prespore cell types, sort in specified ways, and form a finger/slug that undergoes transient or prolonged migration depending on the environmental conditions. Culmination eventually ensues, resulting in a fruiting body with a sorus of spores held several millimeters above the substratum by a vacuolated cellular stalk, and thus situated for dispersal. The initiating events of development of Dictyostelium include sensing starvation and cell density, which in turn result in the dispersed cells acquiring the ability to aggregate. The mechanism of sensing the density of starved cells insures that aggregation occurs only when there are sufficient numbers of starved cells to form aggregates and subsequent structures of appropriate size for optimized spore dispersal [2–4]. Hence, starvation and a threshold of cell density are the two known prerequisites for the transition from growth to development. Two secreted proteins or protein complexes are involved in sensing cell density . Prestarvation factor (PSF) is a glycoprotein that is secreted when cells are growing and accumulates as an indicator of the ratio of cell density relative to the supply of food [6, 7]. When the ratio of Dictyostelium cells to nutrients is above a certain threshold, PSF induces the expression of several early developmental genes including discoidin I, lysosomal enzymes, and some components of the cAMP pulsing system [8, 9]. Once nutrients are depleted, PSF production declines and a second cell density-sensing pathway is activated. Conditioned medium factor (CMF) is a 80 kDa glycoprotein that is essential for early development [3, 4, 10]. CMF is sequestered in vegetative cells and is secreted upon starvation . A critical concentration of extracellular CMF is required for subsequent development as CMF is involved in regulating aggregation, cAMP pulsing, and early developmental events [2, 3, 11]. Recently several secreted protein factors were identified that control the size of aggregates and subsequent developmental structures. A large protein complex, counting factor, was purified from conditioned medium and shown to be involved in causing streaming cells to break up into groups of cells in order to generate mounds and subsequent developmental structures of the desired size [12, 13]. One of the subunits of counting factor was identified and characterized, and cells that are null for the Countin subunit lack counting factor activity . The result is massively large mounds and subsequent structures, with fruits that are too large to maintain their normal upright posture. Recently, another protein factor, countin2, was identified as a regulator of the minimum size of aggregates . Although recent investigations have revealed several components involved in regulating the initiation of development [15–18], little or no information exists on how the cells sense starvation and in particular amino acid deprivation. Early studies indicated that depletion of amino acids and not other nutrients is essential for initiation of development [19–21]. Upon amino acid starvation, among other events there is a substantial decrease in the rate of initiation of protein synthesis, resulting in a reduction in size and amount of polysomes and accumulation of free ribosomes [19, 22, 23]. It is believed that the decrease in protein synthesis in response to starvation occurs post-transcriptionally, since adding back amino acids rapidly restores protein synthesis and does not require new mRNA synthesis . In yeast and mammalian cells, GCN2 is a protein that senses amino acid starvation and brings about altered cell physiology in response to such starvation [24, 25]. GCN2 is a protein kinase that phosphorylates the α subunit of the translation initiation factor eIF2 . The GCN2 protein from yeasts, Drosophila, and mammals is composed of three domains: a pseudokinase domain that may function as a regulatory domain, a kinase domain, and a HisRS domain that shares significant similarity to histidyl-tRNA synthetases [27–30]. Studies of yeast GCN2 revealed that the HisRS domain binds uncharged tRNAs that accumulate when cells are starved for amino acids [31, 32]. As a result the kinase domain is activated and phosphorylates eIF2α at Ser51. 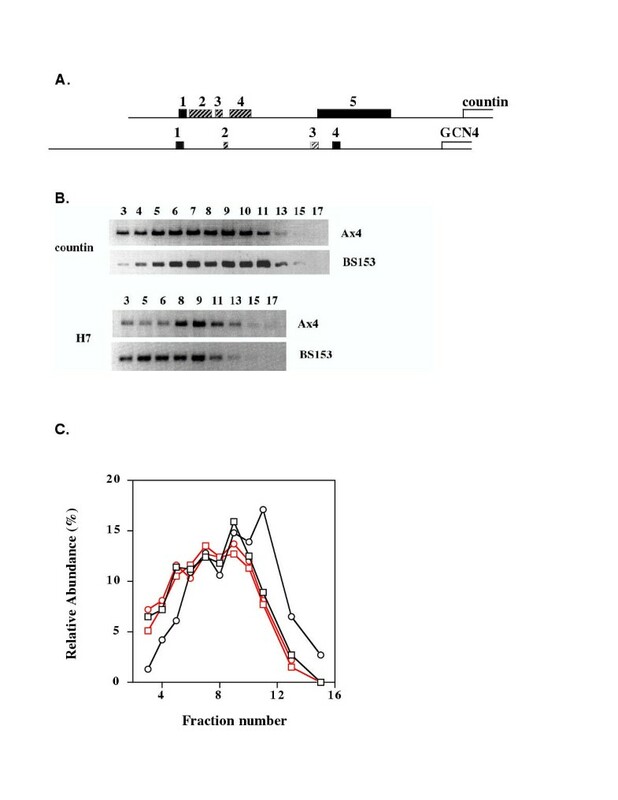 Investigations with yeast GCN2 also suggest that that C-terminus is required for ribosome binding and facilitates GCN2 dimerization and activation [33–35]. During initiation of protein synthesis, the ternary complex, eIF2/GTP/methionyl-tRNAi, is an obligate intermediate in the binding of the initiator methionyl-tRNAi to the 40S ribosomal subunit. Phosphorylated eIF2α competitively inhibits the guanine nucleotide exchange factor eIF-2B, which is responsible for the recycling of eIF2 by catalyzing the conversion of eIF2-GDP to the active form eIF2-GTP . Thus the overall initiation of translation is inhibited when eIF2α becomes phosphorylated. Although the overall rate of initiation of translation is reduced by eIF2α phosphorylation, the translation of some specific mRNAs is greatly enhanced under these conditions [24, 25]. The characteristic feature of mRNAs whose translation is enhanced by GCN2 phosphorylating eIF2α are several upstream open reading frames (uORF) within the 5' untranslated region (5'UTR) of the mRNAs. The uORFs are involved mechanistically in the enhanced initiation of these mRNAs . We reasoned that a GCN2-like protein might be involved in sensing amino acid starvation in Dictyostelium and in regulating the growth to development transition. Searches of the Dictyostelium sequence databases revealed two potential GCN2-like genes that we named ifkA and ifkB (initiation factor kinase). The two Ifk proteins possess all of the hallmarks of typical GCN2 proteins, including the characteristic kinase domain and the HisRS domain. IfkB is unique among GCN2-like proteins in that it does not possess the amino terminal pseudokinase domain. The findings presented herein indicate that neither of the ifk genes is involved in initiating development. However disruption of the ifkA gene resulted in several defects during the first few hours of development. ifkA null cells aggregated earlier than normal due to a more rapid establishment of the cAMP pulsing system. Cells lacking a functional IfkA protein also formed larger mounds and subsequent developmental structures. This defect was linked to a reduced extracellular level of Countin. Efficient translation of countin mRNA required increased phosphorylation of eIF2α by IfkA. The increased phosphorylation by IfkA normally occurs from 1 to 7 hours after the onset of development, resulting in a secondary shift from polysomes to free ribosomes for bulk mRNA. Using the yeast GCN2 amino acid sequence as a query sequence, searches of the Dictyostelium genomic and cDNA sequence databases revealed two ORFs with significant identity to GCN2 proteins of yeast and mammals. These were named ifkA and ifkB, for initiation factor kinase. The ifkA ORF contains 2258 amino acids, and the ifkB ORF contains 1360 (fig. 1A). The predicted IfkB protein is a shortened version of the ifkA sequence; it is missing the first 898 amino acids found in IfkA, and it shares 99% sequence identity (at the DNA and amino acid level) for the remainder of the sequence. Several primers were designed to amplify and sequence the 5'-upstream sequences of the ifkA and ifkB ORFs. The results confirmed the sequences in the databases. RT-PCR followed by sequencing was also employed to confirm the predicted translation start sites. A) Amino acid sequences for IfkA and IfkB. The sequence for IfkA is shown in full. The first 898 amino acids that are not found in IfkB are boxed. For the remainder of the sequence, amino acid residues that differ between the two proteins are given in bold (IfkA) with the corresponding amino acid for IfkB shown underneath; a "-" indicates residues not found in IfkB. B) Schematic structures of IfkA, IfkB and GCN2 of yeast. Conserved regions are shown in black or striped. These include the pseudokinase domain, the kinase domain, and the histidyl-tRNA synthetase (HisRS) domain, including the m1-m3 motifs of the HisRS domain. The open regions inside the kinase domains are the insert sequences between the 4th and 5th kinase subdomain and are not conserved among GCN2 genes from different species. The final black box at the C-terminus of yeast GCN2 indicates a cluster of positively charged residues which are thought to function in ribosome binding and dimerization. No similar sequence was identified in this region within the Dictyostelium genes. The overall sequence identity between yeast GCN2 and the predicted Dictyostelium IfkA protein is 32%. Within the amino terminal sequences, yeast and other GCN2 proteins have a degenerate kinase domain of unknown function . There is a 63 amino acid long sequence in IfkA that has 38% identity to the V and VI subdomains of the IfkA/B kinase domain, indicating the presence of an amino terminal pseudokinase domain in the Dictyostelium protein (fig. 1B). The sequence identity within the HisRS domain of IfkA/B and yeast GCN2 is 28%, with strong conservation within the M1, M2, and M3 motifs that are characteristic of class II aminoacyl-tRNA synthetases . The similarity between the kinase domains is much higher, with IfkA/B possessing 44% identity with yeast GCN2, with high conservation of all of the kinase subdomains. A significant difference between the Ifk kinase domain and yeast GCN2 kinase domain is the length of the insert sequence between subdomain IV and V, which is around 290 amino acids in the Dictyostelium Ifk protein and 110 amino acids in yeast GCN2. Oligonucleotides were designed that when used in RT-PCR reactions would detect both genes or would be specific for the ifkA gene. RNA was isolated from the parental or "wild type" strain (Ax4) and the ifkA null strain (BS153, described below) during growth and at various times after the onset of development. Panel A of fig. 2 represents the additive mRNA levels from both genes in Ax4 during growth and development, while panel B reflects ifkB mRNA levels and panel C reflects ifkA mRNA levels. The results indicate that both genes are expressed during growth. IfkB mRNA expression remains constant as development proceeds, while the levels of ifkA mRNA dramatically drop soon after the onset of development and remain at a low level for the remainder of development. No ifkA mRNA was detected in BS153, the ifkA null strain (not shown). Detection of ifkA and ifkB mRNA levels. Total RNA was isolated from growing cells (0) and at the times indicated (in hours) after the onset of development. RT-PCR was carried out using oligonucleotides that detect both ifk mRNAs using RNA from the parental strain, Ax4 (panel A) or RNA from the ifkA null strain, BS153 (panel B). Oligonucleotides specific for ifkA also were used with RNA from Ax4 (panel C), and these primers gave no band when used with RNA from BS153. The picture for panel C was taken at a longer exposure time than the other two panels in order to reveal the faint bands present during development. H7 specific oligonucleotides were used as controls (H7 is a constitutively expressed gene), and the H7 band was similar in intensity for all lanes (panel D, Ax4 RNA; panel E, BS153 RNA). To examine the function of the ifk genes, we attempted to disrupt each gene individually. To date, several disruption attempts, using several different disruption constructs, have been made for ifkB. However, no disruptions have been obtained, indicating that perhaps the ifkB gene is essential. Attempts to disrupt ifkA were carried out using a plasmid that contained a blasticidin resistance cassette flanked by two fragments of the ifkA gene, each about 800 bp long and derived from the pseudokinase and kinase domains. The blasticidin resistance cassette replaced a 391 bp fragment that includes the first four subdomains (the ATP binding site) of the kinase domain. As only the 3' flanking sequence of the blasticidin resistance cassette is found in ifkB but not the 5' flanking sequence, the disruption construct should be specific for ifkA. Several independent blasticidin resistant colonies were obtained and were initially screened using PCR. Four colonies were indicated as being disrupted in the ifkA gene, and these were examined by Southern analysis. All four showed an expected 1 kb shift compared with the parental strain, Ax4, resulting from the presence of the blasticidin resistance cassette (Fig. 3). RT-PCR using oligonucleotides specific to ifkA revealed no ifkA mRNA in these strains (not shown). The strain used in lane 3 was termed BS153, and this ifkA null strain was used in subsequent work. Some of the results below, including the morphology during development, were confirmed in the other, independently isolated null strains. Southern analysis of transformants potentially disrupted for ifkA. DNA was isolated from the parental strain, Ax4 (lane 1), and from 4 independently isolated transformants (lanes 2–5) for which PCR had indicated possession of a disrupted ifkA gene. DNA from each was digested with SwaI, subjected to Southern blotting, and probed with a radioactive ifkA fragment. Disruption of the ifkA gene should result in a shift of about 1000 bp due to the insertion of the blasticidin cassette (1400 bp) and the loss of about 400 bp of the endogenous kinase domain. All of the analyzed transformants showed the expected shift, and the strain represented in lane 3 was designated BS153. BS153 cells, possessing a disruption of the ifkA gene, grew slightly slower than the parental Ax4 cells in axenic broth, doubling in 10 hour instead of 8 hours (data not shown). Growth on bacteria, however, was similar for both strains. BS153 and Ax4 cells were grown on bacteria and plated under standard conditions of development after removal of the bacteria. BS153 cells were able to develop and form fruiting bodies, indicating that if IfkA is involved in sensing amino acid starvation to initiate development this involvement is nonessential. However, development of BS153 cells was atypical in several ways. The ifkA null cells aggregated earlier than the parental Ax4 cells (fig. 4). BS153 cells formed ripples, the first visual sign of aggregation, as early as 4 hours, and the tight mound stage was attained by 7 to 8 hours after the onset of development. Ax4 cells began rippling by 7 to 8 hours and formed mounds by 11–12 hours. The morphology during development of the ifkA disrupted strain, BS153, and the parental strain, Ax4. Cells of both strains were plated for development under standard conditions. Pictures were taken at the indicated times in hours after the onset of development, all at the same maginification. 7 hr: BS153, tight mounds; Ax4, ripples. 14 hr: BS153 and Ax4, transient slugs; 24 hr: BS153 and Ax4, fruiting bodies. For BS153, several toppled fruiting bodies are indicated by the arrows. Both strains also were developed at a cell density about 6 fold lower than the normal cell density (low cell density panels). In addition to precocious aggregation, BS153 mounds were significantly larger than those of the parental strain. The size of BS153 mounds was more variable than Ax4, but the majority of the mounds and subsequent structures were much larger than those of Ax4 (fig. 4). Attempt to determine cell numbers in BS153 fingers were hampered by apparently stronger than normal cell-cell adhesion and thus incomplete dispersal of the cells for counting. Based on the number and volume of the mounds relative to those of Ax4, we estimated that most BS153 mounds were more than 50% larger than Ax4 mounds. The timing of the conversion of mounds to fingers was normal for BS153 cells. Fingers that formed from the smaller mounds went through a transient slug stag of about 1 hour, comparable to what occurred with Ax4 fingers. However, most of the larger fingers fell to the substratum and underwent extended migration as slugs (4–6 hours). During migration, more cells than normal were sloughed off and left behind in the slime trail. Although this reduced their size, after culmination (which was completed with normal timing) many of the fruiting bodies of BS153 possessed thickened stalks and large sori (fig. 4). Several fruits were unable to remain upright. Germination of BS153 spores was examined and found to be similar to that of Ax4. When developed at low cell density in monolayers, 1.6 × 105 cells/cm2 instead of 1.0 × 106 cells/cm2, the ability of BS153 cells to form large aggregates was more evident. As shown in fig. 4, BS153 cells formed a few large fruiting bodies with thick stalks and a few small fruits, while Ax4 formed over 20 typically proportioned fruiting bodies of small but uniform size. Development of the cells in monolayers in buffer or in conditioned medium from BS153 or Ax4 cells  indicated that secreted factors were involved in causing both the earlier aggregation of BS153 cells and the larger size of the resulting multicellular entities. (not shown). One secreted factor that is involved in regulating aggregation, cAMP pulsing, and early developmental events is CMF [2, 3]. CMF mRNA levels were normal in BS153 during growth and development (not shown). In addition, CMF protein levels, both cellular and secreted, also were normal in growing and developing BS153 cells (fig. 8B). To examine at the molecular level the reason for the earlier aggregation of ifkA null cells, the mRNA levels were examined for two proteins involved in the cAMP pulsing mechanism of aggregation and chemotaxis. The cAMP cell surface receptor Car1 (carA gene) is responsible for sensing secreted cAMP and activating adenylyl cyclase (acaA gene), which in turn results in the production and secretion of cAMP in order to relay the cAMP pulses . Normally both of these genes are expressed at very low levels in growing cells, and their expression is induced during the first few hours of development, including a stimulation of expression by the cAMP pulses themselves . RT-PCR was carried out on RNA isolated from growing cells and at various times after the onset of development of BS153 and Ax4 cells (fig. 5). 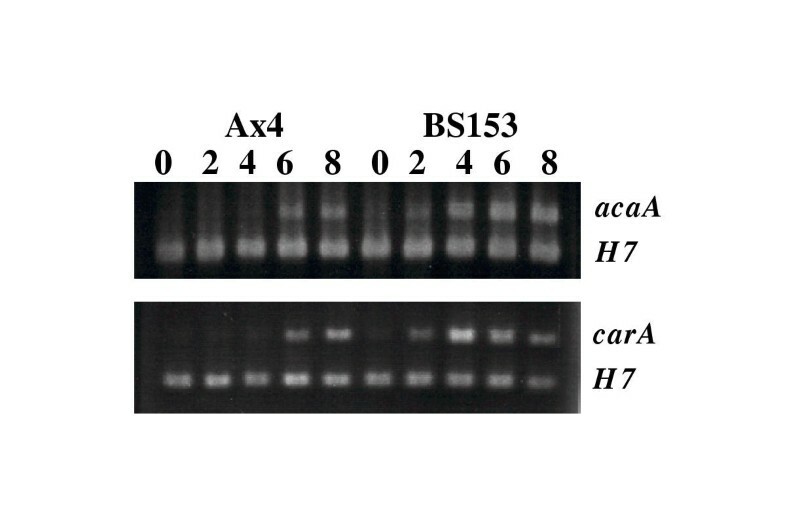 Both carA and acaA mRNA were detected at least 2 hours earlier in BS153 cells in comparison to Ax4 cells. Additionally, higher levels for both mRNAs were found in developing BS153 cells. The decrease in carA mRNA that is normally not seen until 12 hours or so in Ax4 cells was occurring by 8 hours in BS153 cells. Discoidin is another gene that is induced early but is repressed by cAMP pulses once they are established. In BS153 cells, discoidin mRNA was induced, reach maximum levels at 4 hour and rapidly decreased by 8 hours, the time mounds were formed (not shown). Both the induction and subsequent loss of discoidin was 2 to 4 hours ahead of that in Ax4 cells. The findings of earlier induction of these genes and ealier repression of discoidin are consistent with the observed early aggregation of BS153 cells. They indicate that in the absence of a functional IfkA protein, the proteins involved in the cAMP pulsing system are precociously produced, resulting in earlier cAMP pulsing and hence aggregation. Detection of acaA and carA mRNAs in BS153 and the parental strain, Ax4. Total RNA was isolated from growing cells (0) and at the times indicated (in hours) after the onset of development. RT-PCR was carried out using oligonucleotides specific for either acaA mRNA or carA mRNA. H7 specific oligonucleotides were used as an internal control (H7 is a constitutively expressed gene). The predicted amino acid sequence of IfkA has all the hallmarks of being a kinase for eIF2α. eIF2α phosphorylation in Ax4 and the ifkA null strain was examined. Protein was isolated from growing and developing cells and subjected to western analysis using antiserum specific for phosphorylated eIF2α. In the Ax4 parental strain, there was a basal level of phosphorylation of eIF2α found in growing cells, and the level was higher from 2 to 6 hours after the onset of development (fig. 6). This was followed by a slow decline back to the basal level over the next 3 to 4 hours. In contrast, eIF2α phosphorylation in BS153 cells remained at the basal, growth specific level throughout the times of development that were examined (the first 10 hours). Several independent repeats of this experiment were performed, and in each instance the small yet noticeable increase in eIF2α phosphorylation in Ax4 and the lack of an increase in BS153 were observed. For Ax4, the increase in phosphorylated eIF2α was found to be 70–100% greater than the level in growing cells, while the levels in BS153 were found to vary by + 28% among all time points examined. These findings imply that IfkA is responsible for phosphorylating eIF2α during the preaggregation period. eIF2α phosphorylation levels in BS153 and the parental strain, Ax4. Total protein was isolated from growing cells (0) and at the times indicated (in hours) after the onset of development. 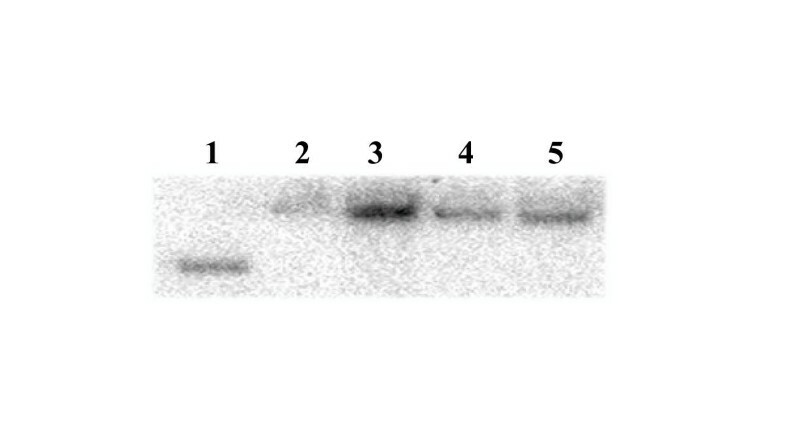 Equal amounts of each protein sample were separated by PAGE, blotted, and probed with antiserum specific for phosphorylated eIF2α. Stripping of the filter and reprobing with antiserum specific for the V4 protein, a protein found at constant levels in growing and developing cells, indicated equivalent amounts of protein in each lane (not shown). In Dictyostelium, a major shift in the polysome profile occurs as a result of starvation and initiation of development [19, 23]. The percentage of mRNA associated with polysomes drops from about 80–90% in growing cells to 50–60% within several minutes of removal of the food source. This reduction was shown to be due to a decreased initiation rate for translation. One possible mechanism to account for the decreased initiation rate is phosphorylation of eIF2α. However, the earliest we could detect a reproducible increase in phosphoryation in Ax4 cells was 45 minutes to one hour after starvation. The previous cited results showed that the shift of ribosomes off of polysomes occurs earlier, and indeed we found that the shift occurred within both Ax4 and BS153 cells (table 1). This initial shift off of polysomes was of the same magnitude in both strains, and it was detected within minutes, prior to when we observed increased phosphorylation of eIF2α. Percent polysomes and monosomes for different RNA samples isolated from AX4 and BS153. RNA was quantitated in the polysome region (fractions 3–11 as seen in fig. 7) and the monosome region (fractions 13–16) as described in the text. Two independent 4 hour samples are shown for both strains. However, at two hours and four hours after the onset of development evidence was found for a second, smaller magnitude polysome shift. This was revealed when the polysome profile of Ax4 cells was compared to that of BS153 cells at these later time points (fig. 7, table 1). From several independent experiments, we consistently found a larger free ribosome peak and a reduction in the polysome regions of the gradients for Ax4 compared to BS153. The increase in the free ribosome peak and decrease in the polysome region were each about 10 to 20% when compared to the BS153 profile or to the profile from Ax4 cells several minutes after starvation. The time period of this secondary shift corresponds to the time when we observed an increased phosphorylation of eIF2α. That neither the increased phosphorylation nor the secondary polysome shift occured in BS153 indicates that IfkA is responsible for both of these events. Although the initial decrease in translation is a result of a different mechanism, we conclude that phosphorylation of eIF2α by IfkA from about 1 to 7 hours after the onset of development results in a further decrease in overall translation initiation and thus in a secondary shift of polysomes to free ribosomes. The polysome profiles in BS153 and the parental strain, Ax4. Lysates, cleared of debris and nuclei, were prepared from both strains 4 hours after the onset of development and were used as a source of polysomes/ribosomes. RNA concentrations in the lysates were determined spectrophotometrically. Sucrose gradient centrifugation was carried out on equal amounts of each sample to generate the polysome profile. The OD at 254 nm was read continuously, and fractions were collected. The black, thin line represents the profile from BS153 and the thicker, gray line is the Ax4 profile. Fractions 3 through 11 represent polysomes with decreasing numbers of associated ribosomes going from fraction 3 to fraction 11, while fractions 13 through 16 represent free ribosomes. Countin mRNA and protein levels in BS153 and the parental strain, Ax4. A) Total RNA was isolated from cells growing on bacteria (0) and at the times indicated (in hours) after the onset of development. RT-PCR was carried out using oligonucleotides specific for countin mRNA (upper band in each panel). 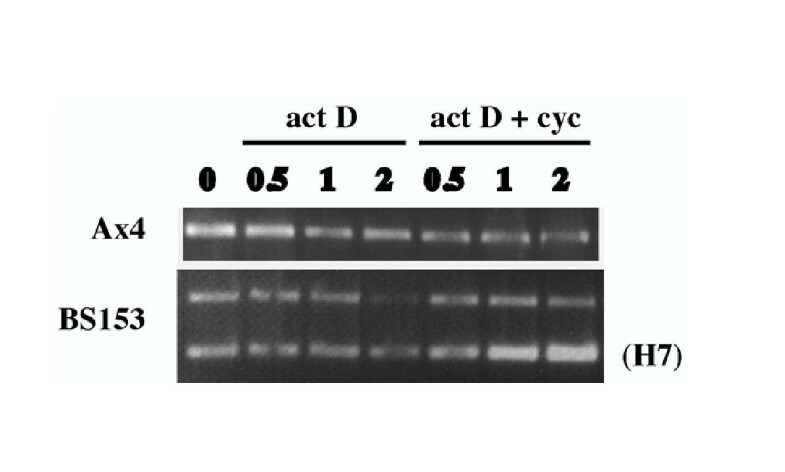 H7 specific oligonucleotides were used as an internal control (lower band in each panel). B) Ax4 and BS153 cells were washed free of bacteria, resuspended in PDF buffer at 5 × 106 cells/ml, and were incubated with shaking for the times indicated (in hours). For cellular Countin, samples were removed, and the cells were pelleted and washed. 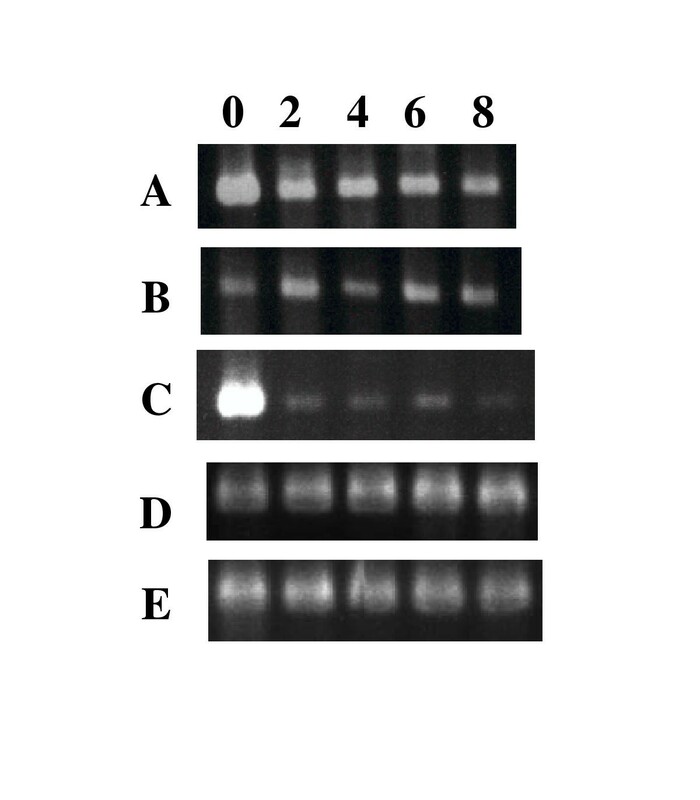 Total protein was isolated from the cells, and equal amounts of each protein sample were separated by PAGE, blotted, and probed with antiserum specific for countin (Cell panel). The conditioned medium (CM) from each sample, after removal of the cells, was used as a source of secreted Countin. The proteins from equal volumes of the CM samples were separated by PAGE, blotted, and probed with antiserum specific for Countin (CM panel). The 6 and 12 hour conditioned medium samples were concentrated, and the proteins from equivalent volumes were separated by PAGE, blotted, and probed with antiserum specific for conditioned medium factor (CMF panel). Counting factor is a secreted, large protein complex that regulates the number of cells within and thus the size of mounds . One of the polypeptides of the counting factor complex is Countin. Disruption of the countin gene results in extremely large mounds and fruiting bodies . As noted above, one of the phenotypes associated with disruption of the ifkA gene was large aggregates and fruiting bodies, and these aberrations appeared to result from a secreted factor(s). Thus, the expression of countin was examined in the mutant cells. In the parental strain Ax4, the level of countin mRNA gradually decreased with time after the onset of development (fig. 8A), consistent with previous findings . In contrast, the decrease of countin mRNA was much more dramatic in BS153, with little detectable mRNA present by 8 hours. 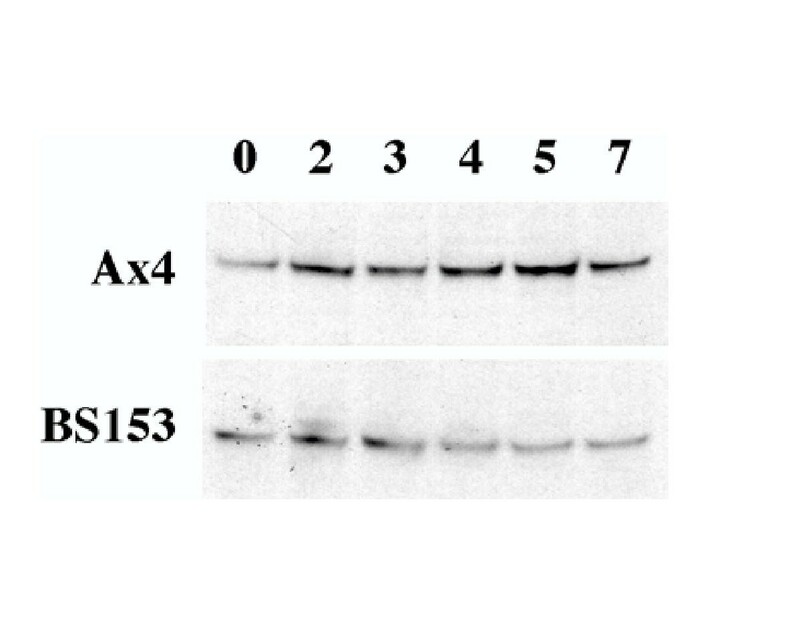 To study the synthesis and secretion of the Countin protein, BS153 and Ax4 cells were removed from the bacterial food source and shaken in normal starvation buffer for varying times. Samples of both cells and (conditioned) medium were processed for western analysis using antiserum specific for the Countin protein (fig. 8B). In both Ax4 and BS153 cells, Countin remained at a constant level within cells with time after starvation. At each time point, however, less countin was found in BS153 whole cell lysates relative to the levels in Ax4 lysates (Cell panels). Analysis of the conditioned medium from Ax4 cells indicted that extracellular Countin increased with time as was expected fig. 8B, CM panels). However for BS153, levels of secreted Countin were reduced relative to those of Ax4, and by six hours only modest amounts of Countin had accumulated that were roughly equivalent to the accumulated level after 1.5 hours for Ax4 (CM panels). In contrast to the findings for extracellular Countin, levels of secreted CMF were the same for Ax4 and BS153 cells (CMF panels), thus ruling out a general decrease in sectreted proteins in the mutant strain. Although extracellular Countin did appear to accumulate with starved BS153 cells, its concetration was reduced and accumulation was slower compared to Ax4 cells. These findings suggest that the increased size of mounds and fruiting bodies characteristic of the ifkA null strain may be a result of decreased production and accumulation of extracellular Countin. An examination of the 5' untranslated region (5'UTR) of the countin mRNA revealed 5 short upstream open reading frames (uORFs). A hallmark of mRNAs, including the yeast GCN4 mRNA, that are specifically regulated by GCN2 of yeast and mammals is the presence of several uORFs within the 5' UTR [24, 25]. The uORFs of countin mRNA, along with those of yeast GCN2 mRNA, are shown schematically in fig. 9A. The similarity suggests that Countin expression may be specifically regulated by IfkA phosphorylation of eIF2α. To examine this possibility, the distribution of countin mRNA within the polysome profiles of Ax4 and BS153 were examined before and after the onset of development. A) Schematic drawing of the 5' leader region of countin and yeast GCN4 mRNAs. 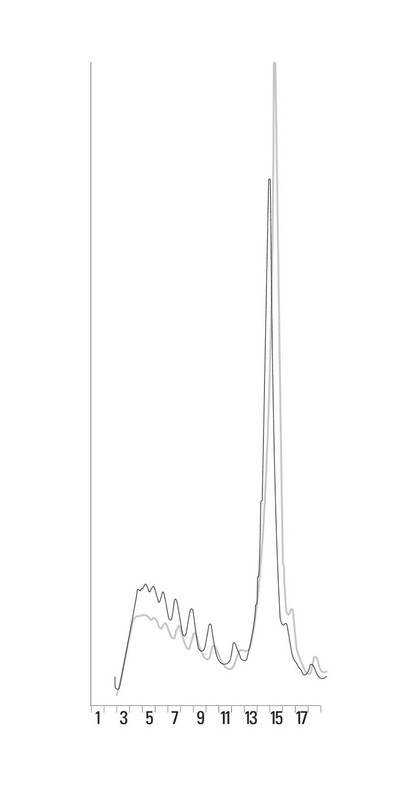 The position and size of uORFs are drawn to scale. The first and last uORFs are marked as black boxes, other uORFs are designated by striped boxes, and the open box at the 3' end represents the beginning of the coding region for countin and GCN4. B) Countin and H7 mRNA distributions within the polysomes and ribosome fractions prepared as described in figure 7from BS153 and the parental strain, Ax4, after 4 hours of development. RNA was extracted from the isolated sucrose gradient fractions and was used in RT-PCR reactions with countin or H7 specific oligonucleotides. The numbers refer to the fraction used, and correspond to the numbers given in figure 7. Fractions 3 through 11 represent polysomes with decreasing numbers of associated ribosomes in going from fraction 3 to fraction 11, while fractions 13 through 16 represent free ribosomes. For the countin panels, the BS153 panel was exposed for a longer period of time than that of Ax4 due to the lower amounts of countin mRNA in this strain at four hours post starvation. C) Quantitation of the data shown in panel B for countin mRNA. Within each strain, the relative abundance of countin mRNA from each fraction was determined by quantitating the band in each fraction and dividing this value by the sum of the values of all the fractions for that strain. Black circles, BS153 from 4 hour polysome profile shown in panel B; red circles, BS153 from 0 hour polysome profile; black squares, Ax4 from 4 hour polysome profile shown in panel B; red squares, Ax4 from 0 hour polysome profile. RNA was extracted from the fractions collected after sucrose gradient centrifugation of cell extracts isolated four hours after starvation. The distribution of countin mRNA was determined by RT-PCR. Fractions 3 through 11 represent polysomes with decreasing numbers of associated ribosomes going from fraction 3 to fraction 11, while fractions 12 through 16 represent free ribosomes (fig. 7). In both BS153 and Ax4 developing cells, countin mRNA was found mostly in the polysome fractions (fig. 9B). However in BS153 in comparison to Ax4, the relative abundance of countin mRNA was reproducibly less in the high polysome fractions and greater in the low polysome and free ribosome fractions (fig. 9B and 9C). The shift in relative abundance of countin mRNA within the polysome profiles of the two strains is opposite the secondary shift identified above for bulk mRNA and for the shift seen for H7 mRNA (fig. 9B). No difference in the distribution of countin mRNA was found between the two strains when polysome profiles from growing cells were examined (fig. 9C). The results indicate that in the absence of IfkA and its phosphorylation of eIF2α during early development, countin mRNA is retained less well on polysomes and has fewer associated ribosomes. This suggests that normally during early development in the wild type strain, enhanced translation of countin mRNA occurs as a result of IfkA phosphorylating eIF2α. The reduction of ribosomes associated with countin mRNA in developing BS153 cells implies a reduced translation efficiency of countin mRNA and probably accounts for the reduced levels of Countin found in the mutant strain. Also, it is possible that reduced association with ribosomes results in a destabilization of countin mRNA, and this might account for the more rapid loss and lower levels of countin mRNA found in BS153 cells after the onset of development. To examine this possibility, countin mRNA levels were examined after the inhibition of transcription, 2 hours after the onset of development, using actinomycin D . After inhibition of transcription, countin mRNA was lost earlier in developing BS153 cells than in the parental Ax4 cells (fig. 10). Two hours after addition of actinomycin, very little countin mRNA remained in BS153 while only modest degradation had occurred in Ax4. Addition of cycloheximide, a translation inhibitor that inhibits dissociation of ribosomes from mRNA , increased the stability of countin mRNA. Addition of cycloheximide has been shown to result in a substantial reduction in the elongation rate of protein synthesis in Dictyostelium and can cause mRNAs with few ribosomes to acquire more ribosomes, i.e., it can reverse the polysome shift . Taken together, these findings suggest that countin mRNA is destabilized in developing ifkA null cells due to the loss of ribosomes and decreased translation efficiency of countin mRNA in these cells. Relative countin mRNA stability in BS153 verses the parental strain, Ax4. Cells from both strains were plated under standard conditions of development after removal of bacteria. After two hours, the filters supporting the cells were transferred to paper pads soaking in fresh PDF plus actinomycin D (actD) or fresh PDF plus actinomycin D and cycloheximide (actD + cyc). After the transfers, a filter of cells was harvested at 0.5, 1, or 2 hours. Total RNA was isolated from these samples and from cells at the time of transfer (0). RT-PCR was carried out using oligonucleotides specific for countin mRNA (upper band in BS153 panel). For the BS153 panel, the band corresponding to H7 mRNA (lower band) is shown as an internal control. The H7 band increases with time in the actD + cyc lanes as H7 transcription is induced by cycloheximide . Recent findings indicate the presence of another Countin-like factor, Countin2, that is involved in regulating aggregate size . Countin2 mRNA levels were found to be the same in BS153 and Ax4 during growth and development (not shown). The multicellular developmental program of Dictyostelium is a response to starvation with the goals being the survival of some cells, in the form of protected spores, and dispersal of the survivors in hopes of finding an environment that supports growth. Depletion of amino acids as opposed to other nutrients such as glucose and vitamins was shown to be responsible for shutting down growth and cell division and initiating the developmental program [19–21]. Although substantial progress on the regulation of the initiation of development in Dictyostelium has been made [15–18], how the cells sense starvation and in particular amino acid deprivation is unknown. GCN2 of yeast and mammals is a known sensor of amino acid starvation and regulates cellular responses to such starvation [24, 25]. Using degenerate primers and PCR and database searching identified two GCN2-like genes in Dictyostelium, ifkA and ifkB. Thinking that one or both of these genes may play a role in sensing amino acid starvation and in initiating development, we carried out the work described herein to examine their functions. The predicted amino acid sequences of IfkA and IfkB are nearly identical within the kinase domain and the HisRS domain, and in turn these two domains share significant sequence identity with GCN2 proteins from yeast, Drosophila, and mammals. This includes the characteristic features peculiar to the kinase domain of GCN2 proteins, the m1, m2, and m3 motifs of the HisRS domain, and a cluster of positively charged residues at the C-terminus that are thought to function in ribosome binding and dimerization [31, 37, 41]. Within the kinase domain, the Dictyostelium proteins possess an inserted sequence between the 4th and 5th kinase subdomains that is also found in this position in all known GCN2-like proteins. The insert in IfkA and IfkB is significantly longer than that of other GCN2 proteins. The major difference between IfkA and IfkB is the amino terminal extension of about 900 amino acids that is found in IfkA but not IfkB. Similar extensions amino terminal to the kinase domain are found in GCN2 proteins from other species, and the function of this portion of the protein is unknown. This region has limited sequence identity to the kinase domain, and thus has been termed the pseudokinase domain . Similarly, the extension in IfkA shows limited sequence identity to the kinase domain. In contrast, IfkB begins at the kinase domain and is the only known GCN2-like protein that does not possess a pseudokinase domain. Even though a number of attempts have been made, we have been unable to disrupt the ikfB gene. This suggests it is an essential gene, a property not found for eIF2α kinases of other organisms, and we currently have no insight into its function. Although it is possible that IfkB plays a role in the transition from growth to development, we do not think it does. A basal level of eIF2α phosphorylation was found in growing cells, and this basal level was maintained during development in the ifkA null strain. Thus we have not detected any changes in eIF2α phosphorylation that can be attributable to regulated IfkB activity. Instead, only a basal and unchanging level of phosphorylation during growth and development can be attributed to IfkB. A very early event marking the initiation of development is a substantial reduction in overall translation initiation and a concomitant major shift of ribosomes from mRNA-associated ribosomes (polysomes) to free ribosomes [22, 23]. The percentage of mRNA associated with polysomes drops from about 80–90% in growing cells to 50–60% within several minutes of the removal of the food source. We detect no increase in eIF2α phosphorylation within this time frame, indicating that enhanced eIF2α phosphorylation is not the mechanism used to bring about the rapid, initial decrease in the initiation of protein synthesis. Disruption of the ifkA gene was accomplished, and several defects were found in the null strain (BS153) that indicted a role for IfkA and eIF2α phosphorylation during the first several hours of development. Examining the morphology of the null strain revealed two major aberrations relative to the normal morphology attained during development. BS153 cells aggregated and formed mounds two to four hours earlier than the parental cells. Earlier aggregation was seen when cells were developed at both high and low cell densities. The early aggregation phenotype associated with BS153 suggests that the cAMP pulsing system was established earlier than normal. This was confirmed, indirectly, by examining the expression of several of the components of the pulsing system. mRNA for both Carl, the cell surface cAMP receptor, and AcaA, the adenylyl cyclase responsible for cAMP synthesis, was found to be induced 2 to 4 hours earlier than in the parental cells. The levels of these mRNAs were also greater in developing BS153 cells. Thus, the components of the pulsing system are produced earlier and to higher levels when IfkA is not functioning. In addition, these genes are "pulse-induced" genes and thus their induction during early development normally is enhanced and promoted as the cAMP pulses are established . The early and more abundant induction of their mRNAs in BS153 indicate that the pulsing system is functioning earlier in the absence of IfkA. The earlier and more rapid loss of discoidin mRNA reinforces this conclusion as discoidin is a "pulse repressed" gene . Examination of eIF2α phosphorylation in ifkA null cells indicated that the IfkA protein is responsible for increased phosphorylation eIF2α from 1 to 7 hours after the onset of development. Although an increase was seen in the parental strain during this time frame, eIF2α phosphorylation levels in developing BS153 cells remained at the lower basal level found in growing cells. Concomitant with the increased eIF2α phosphorylation in the parental strain was a secondary shift of ribosomes from polysomes to free ribosomes. A decrease in polysomes of about 15 % and an equivalent increase in free ribosomes was observed when the polysome profile of Ax4 cells developed for 2 or 4 hours was compared to the profile from BS153 cells developed for the same time or to the profile from Ax4 cells developed for only 10 minutes. These results indicate that IfkA is normally active from about 1 hour to about 7 hours after starvation and normally phosphorylates eIF2α during this time period (however, we have no direct data that demonstrates IfkA phosphorylates eIF2α).. IfkA activation at these times results is a reduction in overall protein synthesis initiation as indicated by the secondary shift of polysomes to ribosomes. Based on the normal function of GCN2-like proteins , these findings suggest that uncharged tRNAs are more prevalent within the cells during this time relative to either growing cells or to cells immediately after removal of the food source. In addition to the earlier aggregation phenotype of developing BS153 cells, the IFkA null cells also formed atypically large aggregates, mounds, and subsequent developmental structures. This phenotype is reminiscent of cells that lack Countin, a component of counting factor that regulates the size of aggregates [12, 13]. Countin mRNA was found to be lost significantly more rapidly in developing BS153 cells relative to the parental Ax4 cells. Examination of the stability of countin mRNA indicated that it was turned over more rapidly in BS153 cells during early development. This suggests that countin mRNA is destabilized in developing cells that lack IfkA function, and we assume that countin mRNA synthesis is not affected in these cells. We suggest the destabilization of countin mRNA may be a result of the loss of ribosomes, which otherwise would afford protection from degradation, from this mRNA in BS153 cells. The distribution of countin mRNA within the polysome profile was altered in developing BS153 cells. As described above, bulk mRNA undergoes a secondary shift from polysomes to free ribosomes in Ax4 cells, and this shift was not seen in BS153 cells as it is dependent upon eIF2α phosphorylation by IfkA. More ribosomes were found to be associated with countin mRNA in early developing Ax4 cells relative to BS153 cells, which is the converse ribosome association with bulk mRNA in the two strains. This finding indicates that countin mRNA is translated more efficiently when IfkA is functioning properly. This is similar to the enhanced translation of certain yeast and mammalian mRNAs (GCN4, ATF4, both transcription factors regulated by GCN2) when GCN2 in these organisms is activated by amino acid starvation, even though bulk mRNA undergoes a decrease in translation efficiency [24, 25]. The hallmark of mRNAs that are upregulated by GCN2 and eIF2α phosphorylation is the presence of several upstream open reading frames within their 5' UTRs. The uORFs are involved mechanistically in bringing about enhanced translation initiation under conditions that otherwise favor a general decrease in translation initiation . Within the 5' UTR of countin mRNA, we find uORFs similar in number and in arrangement to those of GCN4 mRNA, the major mRNA regulated by yeast GCN2 . Thus, we suggest that countin mRNA, and probably other as yet identified mRNAs, are translationally upregulated when IfkA phosphorylates eIF2α during the preaggregation period, or from 1 to 7 hours after the onset of development. A result of the lack of increasing the translational efficiency of countin mRNA in developing ifkA null cells should be less Countin protein in these cells. Indeed we found less intracellular Countin throughout the first 8 hours after the onset of development of BS153 cells. In addition, there was significantly less Countin secreted during the first 8 hours of development. Countin, as an essential component of counting factor, regulates aggregate size after it is secreted. A high extracellular concentration of counting factor is interpreted by the cells of indicating a large number of cells within an aggregating stream. This causes the break-up of the aggregating stream into groups of the normal number of cells . Thus, the large size of the structures formed by developing BS153 cells can be accounted for by the lower extracellular Countin concentration and thus a lack of breaking up into smaller groups of cells. The heterogeneity of the size of the aggregates of developing BS153 might arise from the fact that extracellular countin levels eventually reach near normal levels, at about 10 to 12 hours after the onset of development. The reduced levels of Countin are not thought to account for the early aggregating phenotype of cells lacking IfkA since early aggregation was not found for countin null cells . Why would the translation efficiency of countin mRNA be maintained and not reduced as is bulk mRNA during the secondary shift of polysomal RNA? Since the extracellular concentrations of Countin reflect cell density, perhaps it is important to maintain a constant level of Countin production and secretion once development has been initiated. Any drop in translation efficiency might alter the counting mechanism and result in aberrantly sized mounds. 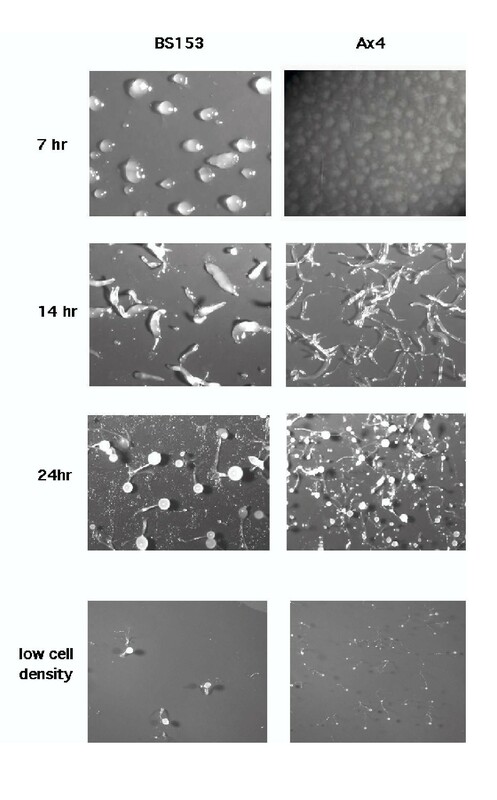 In summary, the findings suggest that IfkA is an eIF2α kinase of Dictyostelium that normally phosphorylates eIF2α from 1 to 7 hours after the onset of development, or during the preaggregation phase. This results in an overall reduction in the initiation of protein synthesis during this time frame and a concomitant reduction in the number of ribosomes associated with most mRNAs (the secondary polysome shift). For some mRNAs, however, initiation of protein synthesis is enhanced or stabilized under the conditions of increased eIF2α phosphorylation. This includes countin mRNA. As a result, appropriate amounts of Countin are secreted and aggregate size is regulated properly. In the absence of IfkA, eIF2α phosphorylation does not increase, resulting in inefficient translation of countin and perhaps other mRNAs. Decreased Countin leads to larger than normal aggregates, slugs, and fruiting bodies. The larger size of many of these fruits results in their toppling over and thus in an inability to properly disperse the spores. Earlier than normal aggregation and cAMP pulsing also result from a lack of IfkA activity during preaggregation, and we postulate that this is due to the production and secretion of an as yet unidentified factor in early developing ifkA null cells. The axenic strain, Ax4 , was used as the parental or "wild type" strain in all experiments. Cells were grown axenically in HL5 media or on SM plates with Klebsiella pneumoniae . Cells grown in the presence of bacteria were using for development as described [46, 47] unless otherwise stated. Initial studies identified a portion of the ifkB gene using degenerate PCR procedures based on the shared sequences of yeast, Drosophila, and mammalian GCN2 proteins. Sequences were eventually identified from the Dictyostelium cDNA project in Japan http://www.csm.biol.tsukuba.ac.jp/cDNAproject.html and the Dictyostelium genomic sequencing program (genome.imb-jena.de/dictyostelium (Genome Sequencing Center Jena); http://www.uni-koeln.de/dictyostelium (University of Cologne); dictygenome.bcm.tmc.edu (Baylor College of Medicine); and http://www.sanger.ac.uk/Projects/D_discoideum (Sanger Centre)). Two GCN2-like genes were identified and named ifkA (NCBI accession AAM43647) and ifkB (NCBI accession AAM33717). A plasmid was constructed that carried 825 bp from the pseudokinase domain ofifkA and 731 bp from the kinase domain, placed at either end of a 1.4 kb blasticidin resistance cassette . A 3.95 kb EcoR I/Hind III fragment, containing the ifkA sequences and the blasticidin gene, was released from the plasmid and it's ends were made blunt using the klenow fragment and dephosphorylated to prevent recircularization and reduce nonspecific integration of the fragment. This fragment was transformed into exponentially growing Ax4 cells using electroporation . Transformants were selected as described . Clonal isolates were obtained, and disruption of the ifkA gene was confirmed by PCR and Southern analysis. All disrupted strains had the same atypical morphology when developed under standard conditions. One strain was used for most of the experiments detailed herein, and is termed BS153. 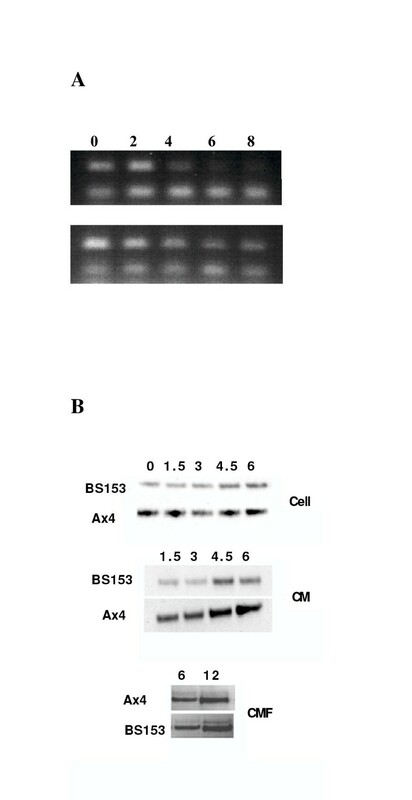 For determination of the extent of eIF2α phosphorylation, Ax4 and BS153 cells were plated for development, and samples were taken at various times. Cells were lysed in a phosphate lysis buffer to prevent protein dephosphorylation (200 mM sodium phosphate, pH 7.5, 20 mM KCl, 5% sucrose, 0.5% NP-40, 1 mM PMSF). The lysate was cleared by spinning at 5000 × g for 10 minutes. The protein concentration of the cleared lysates was determined using the BCA protein assay kit (Pierce, Rockford IL). 40 mg of protein from each sample was separated using PAGE (NuPAGE, Invitrogen, Carlsbad CA). Phosphorylated eIF2α was detected with antiserum specific for the phosphorylated protein (Research Genetics, Carlsbad CA). The amino acid sequence of the phosphopeptide used to raise the antibodies (EGMILSEIS*RRRIRSI, * indicates phosphorylated serine) is highly conserved among the eIF2α proteins of all species, including that of Dictyostelium (I at position 8 is a L in Dictyostelium). 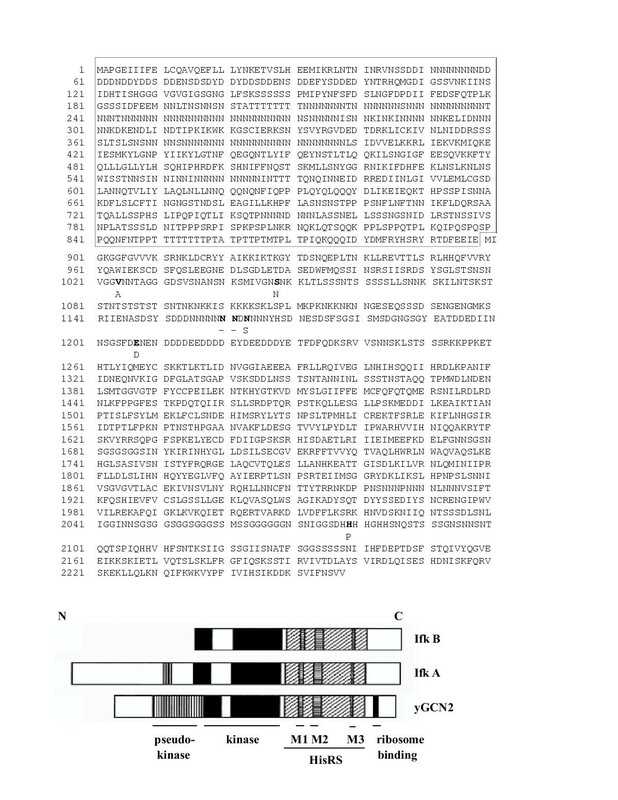 To examine the production of Countin or CMF protein inifkA null cells and Ax4 cells after starvation, mid-log phase cells growing axenically were collected, washed, and resuspended in the standard development buffer (PDF, 20 mM potassium phosphate, pH 6.1, 5 mM magnesium chloride, 0.5% streptomycin sulfate) at 5 × 106 cells/ml. The resuspended cells were shaken at 21°C for 1.5, 3, 4.5, 6, and 12 hours. The cells and buffer from 2 ml samples were collected. The cells were lysed with HMK-NP40 (50 mM Hepes, pH 7.5, 40 mM magnesium acetate, 20 mM potassium phosphate, 5% sucrose, 0.4% NP-40), clarified, and protein concentration determined as above. After removal of the cells, the collected buffer was used as conditioned medium. For detecting Countin at each time point, 20 μl of conditioned medium or 10 μg of protein from the cell lysates was fractionated by PAGE. Countin protein was detected by western analysis using anti- Countin antiserum  kindly provided by Dr. Richard Gomer. For detecting CMF, the 6 and 12 hour conditioned medium samples were concentrated prior to fractionation by PAGE. CMF antiserum was kindly provided by Dr. Richard Gomer. RNA was isolated, processed, and used for RT-PCR as described [51, 52]. For polysome analysis, BS153 and Ax4 cells were harvest from bacterial growth plates before noticeable presence of Dictyostelium cell growth. After removal of bacteria, cells were plated for development as described above. After 2 and 4 hours of development, cells were collected into polysome buffer (HMK-NP40 plus cycloheximide to stabilize the polysomes). To prepare polysome samples from growing cells, cells were scraped from bacterial growth plates and suspended directly into polysome buffer. The cell lysates were spun at 8000 × g for 5 minutes to remove nuclei, cell debris, and bacteria (for growing cell samples). The concentration of RNA in the supernatants was determined spectrophotometrically. 0.5 mg of RNA were layered onto a 11 ml linear sucrose gradient (15–50% sucrose (w/v) in polysome buffer without NP-40), and the gradients were centrifuged in a Beckman SW40Ti rotor at 28000 rpm for 4 hours at 7°C. Gradient fractions were collected and the profile traces were generated by continuous monitoring at 254 nm. RNA from each fraction was isolated by extraction with phenol/chloroform followed by ethanol precipitation. RNA from an equivalent volume of each fraction was subjected to RT-PCR as just described, except the reactions were spiked with a small amount of radioactive dATP for quantitation. Quantitation was carried out using phosphoimaging analysis. For all RNA samples used in RT-PCR reactions, H7 specific oligonucleotides were used as a control; H7 mRNA is expressed at a constant level during growth and development  and thus monitors relative levels of RNA used in the reactions. This work was supported by NIH grant R01 GM59358. We thank Richard Gomer for generously supplying antiserum against Countin protein and Conditioned Medium Factor. RF carried out most of the experiments, assisted in interpretation of results, and participated in writing the manuscript. YX carried out RT-PCR reactions and RNA isolations. CKS conceived of the study, participated in its design and coordination, performedthe initial polysome experiments, and participated in writing the manuscript.